Printing photographs on Canvas is another option for presenting a photographic image as a piece of fine art. 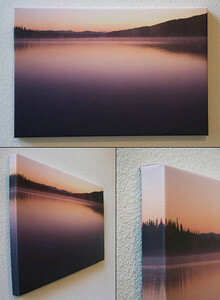 Some people feel the textured look of a canvas print lends a more “artistic” feel to the printed image. The image is printed on the canvas using an ink-jet process known as “Giclee.” The resulting piece can be displayed as a hanging print, included in a box frame, or wrapped around a wooden frame of variable depth (see example to the right). The image can simply “wrap” around the frame or be “mirrored” (example right) to allow the full extent of the image display on the face of the piece. Other border options include solid black, white, or digitally “stretched” versions.